If variety is what you crave in your red wines, then Italy is the place for you. That's not to say their white varieties aren't equally delicous, however a budding red wine lover could easily spend several years drinking his or her way through the native grapes of Italy with little risk of encountering the same wine twice. Italy’s best-known red wine grape, Sangiovese itself (which is primarily used to make Chianti), has dozens of variants across the country. How’s that for diversity? There’s more to Italian reds than Chianti and Sangiovese, of course; so much so that entire books have been devoted to the subject. For those of you craving some wine adventure, it helps to have a quick starting guide to navigating the byways of Italian reds beyond Chianti. Here are five of the most interesting red wine grapes born in Italy, and what you can expect from them. Consider this your “getting started” pamphlet for Italy’s indigenous red grape wonders! While no one is 100 percent certain where in Italy Barbera originated, we know two things for sure: it was born in Italy, and it hits its vinous high notes in the northwestern region of Piedmont. Barbera has a lot going for it. It has a robust, dark color that is instantly appealing, but it’s soft on mouth-puckering tannins and very high in acidity, which makes it a great match for Italian food in general. It offers lots of bright red fruit flavors, and carries the chocolate and vanilla aromas of oak aging very well. What’s more, it tends to make pretty good wine even at high farming yields, making it one of the easiest grapes to work with for winemakers. Small wonder, then, that Barbera is so popular. It’s one of the five most planted native grapes in all of Italy, it’s the third-most common red grape in the country, and it usually ranks in the top fifteen most planted grape varieties worldwide. 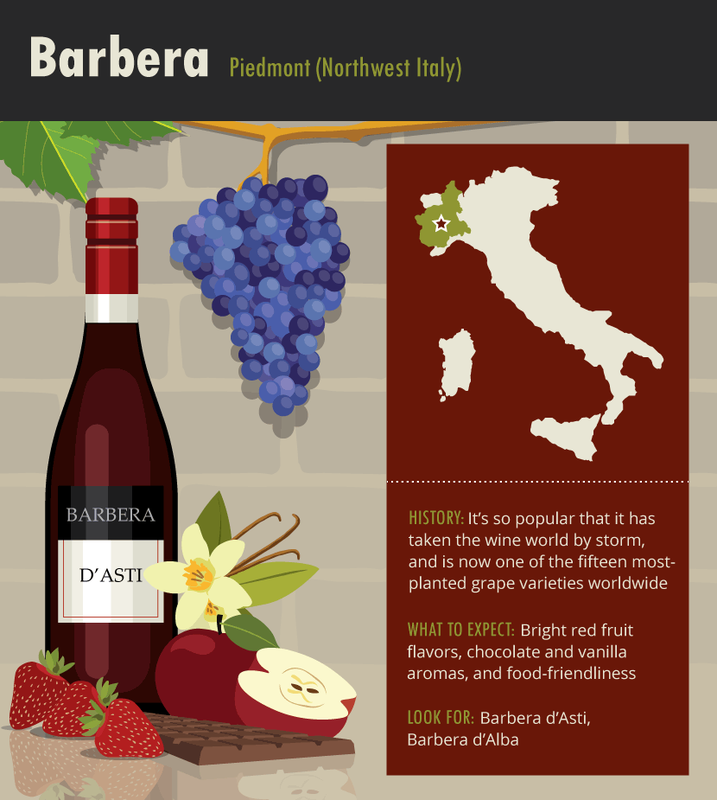 Look for Barbera d’Asti for classic examples, or Barbera d’Alba for richer, more velvety versions. Nebbiolo takes its name from the Latin term for fog, because the grape ripens into the late fall when its home turf of Piedmont tends to get blanketed in the stuff. Though not as well known as Sangiovese, Nebbiolo is the undisputed quality king of Italian red grapes, and is responsible for some of the country’s longest-lived and greatest wines. This king has a history befitting a regal character too. Pliny the Elder might have referred to it, and there are references to the grape that date back to the 1200s. In the early 1400s, laws were passed forbidding the damaging of Nebbiolo vines, and in the late 1700s a count – Count Nuvolone – spent time describing in detail the subtypes of the grape. So Italy pretty much always knew it had a winner in Nebbiolo. ​Nebbiolo produces dynamic, complex, vibrant, and tightly wound wines that can take decades of aging to unfold. Expect dark red fruit flavors, and aromas of licorice, spices, rose petals, and even tar. Look for Barolo if you want something powerful and meaty, or its sister Regino of Barbaresco for a somewhat more elegant take. 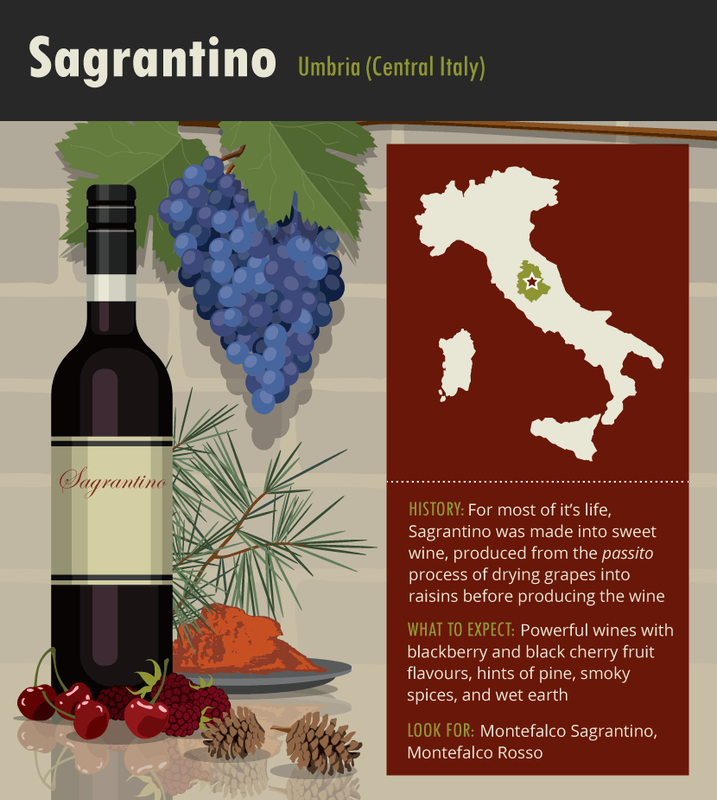 ​In the central region of Umbria, we find another classic red grape: Sagrantino. No one is totally sure of its history, but they are sure that it’s been grown in Montefalco and Umbria for centuries. Interestingly, for most of its life Sagrantino was made into sweet wine, produced from the passito process of drying grapes into raisins before producing the wine. In the twentieth century, however, the quality of the dry wines made from this thick-skinned grape became justifiably well known. If you want hair-on-your-chest, powerful, serious red wine, this is your grape. Sagrantino doesn’t lack for firm structure or alcohol content. Having said that, it’s not a total monster of a wine; while it can age for many years due to its high acidity and tannin content, its structure is powerful but soft around the edges. You’ll get blackberry and black cherry fruit flavors, with hints of pine, smoky spices, and even wet earth. Look for Montefalco Sagrantino, and Montefalco Rosso (a slightly more approachable version). Moving to Italy’s southwest, in Campania, we find a great red grape that might not be Italian. Aglianico has widely been thought to have Greek origins, but more recent claims are challenging that heritage and suggesting the grape might actually have originated in Italy. Either way, it thrives in Campania, where it truly shines. Its name first appears in print in the 1500s, though some have argued that it was being cultivated in Italy as far back as the Roman Empire. 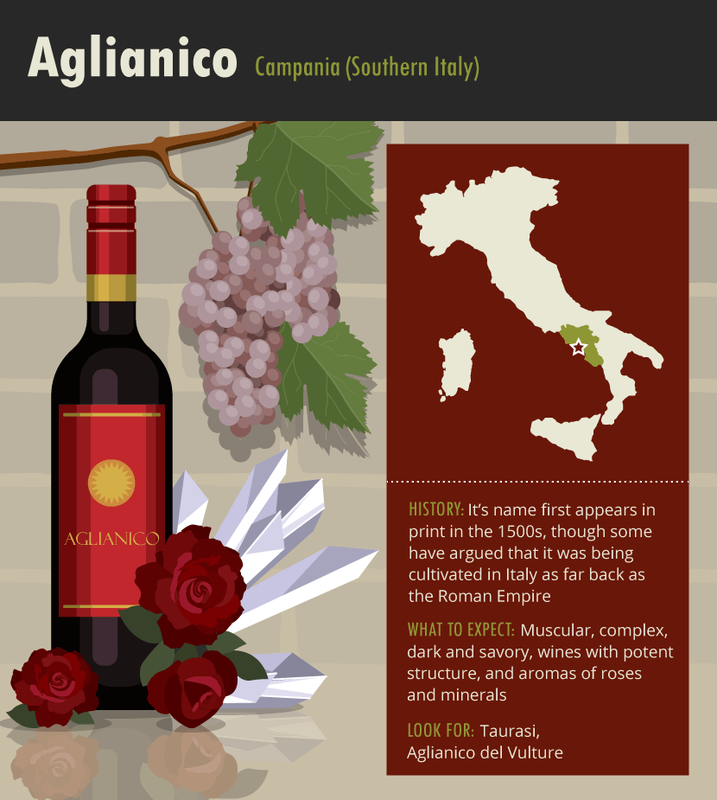 Aglianico’s wines have always been so good that its name was conveniently attached to a lot of grapes to which it has no genetic link, much to the confusion of wine lovers ever since. This grape makes muscular, complex wines (often confused for Nebbiolo), some able to happily live on for decades of cellaring. Generally, the fruit flavors will be dark and savory, the structure will be potent, and the aromas will evoke roses and minerals. Look for wines from Taurasi, and Aglianico del Vulture. ​​The southern Italian island of Sicily has several interesting native grapes, Nero d’Avola (meaning “black from Avola”) being one of the most interesting; especially considering that most of Italy calls it Calabrese, while the rest of the world calls it Nero d’Avola. Confused yet? Nero d’Avola is the second-most common grape in Sicily, and became so popular that its plantings increased by over a third between 2000 and 2008. In the late 1990s, Italians went gaga for this grape, but overproduction led to a reduction in quality, and it went out of vogue quickly. Thankfully, the quality is back on the rise, and stellar examples are again being produced. 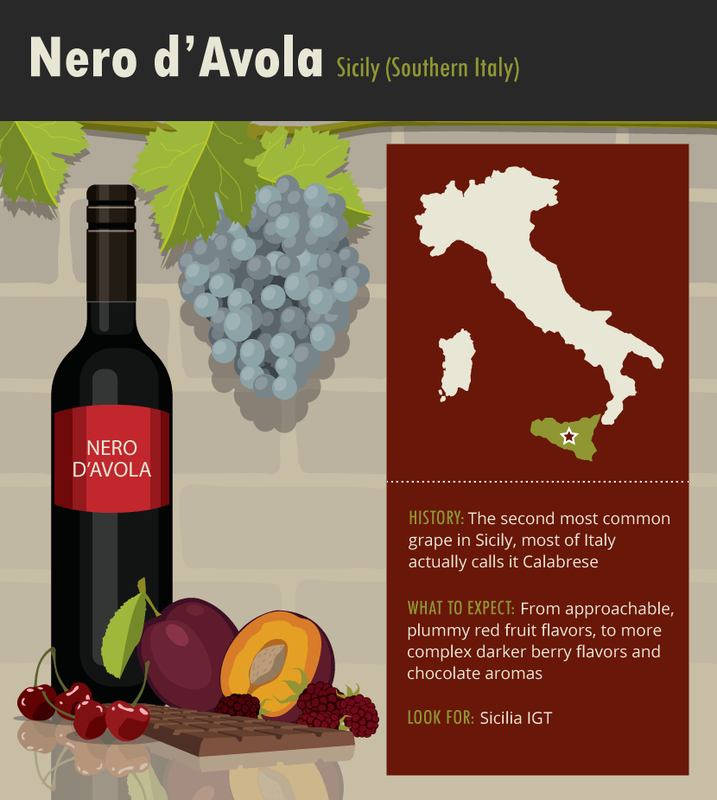 Nero d’Avola is a bit of a vinous chameleon, able to conjure up easy-drinking, everyday wines with plummy red fruit flavors, or more complex wines (often aged in some oak) that bring darker berry flavors and aromas of chocolate. Look for wines designated Sicilia to start your Nero drinking experiments.